NEW YORK, N.Y.; TORONTO, Ontario; and NASHVILLE, Tenn. (May 26, 2010)– The National Hockey League (NHL), the National Hockey League Players’ Association (NHLPA) and the Hockey Hall of Fame (HHOF) today announced the renewal of a partnership with Bridgestone Americas Tire Operations, LLC (BATO) and Bridgestone Canada Inc. (BCA) in which the Bridgestone brand will serve as the “Official Tire of the NHL®, NHLPA and the Hockey Hall of Fame,” for the next five years. As part of the agreement, Bridgestone will return as the title sponsor of the award-winning outdoor game, the Bridgestone NHL Winter Classic®.Title sponsorship of the event delivers a significant platform for Bridgestone to showcase its brand during what is typically the NHL’s most-watched regular-season game, and one of the crown jewels of the New Year’s Day television schedule. As the title partner for the 2011 Bridgestone NHL Winter Classic, Bridgestone will be provided with a number of assets in addition to incorporating its logo into the official game and event mark. These assets include on-air title broadcast rights from all of the League’s broadcast partners (NBC, CBC and RDS); branded promotion in NBC programming; camera-visible dasherboard placements of the Bridgestone logo; in-arena video spots and PA announcements; and integration of the Bridgestone brand throughout all NHL media properties - including video, print, online and radio. Serving as title sponsor for the 2011 Bridgestone NHL Winter Classicis just one of numerous exclusive promotional opportunities for the Bridgestone brand as part of the multi-year agreement. The NHL will grant BFNT and BFCA rights to the League’s premier trademarks and provide numerous exclusive promotional opportunities throughout the NHL season and beyond, including: the NHL Face-Off™, Stanley Cup® Playoffs, NHL Draft, NHL Awards™ and the NHL All-Star game. The deal also provides Bridgestone with the use of NHL Player rights and images. The Bridgestone brand also will leverage its status as the exclusive tire of the NHL and NHLPA by supporting the League’s media properties including NHL.com and NHL Network™, various NHL clubs and by advertising on NHL telecasts in Canada and the U.S. In addition, this sponsorship includes the Mark Messier NHL® Leadership Award Presented by Bridgestone, which recognizes the NHL player who has demonstrated superior leadership in hockey and has made positive contributions to society, and the Bridgestone Mark Messier Youth Leadership Award, which rewards youth hockey players or mentor/coaches for their contributions to youth sports or education. Nashville, Tenn.-based Bridgestone Americas Tire Operations, LLC (BATO) is a subsidiary of Bridgestone Americas Holding, Inc., whose parent company, Bridgestone Corporation, is the world’s largest tire and rubber company. BATO develops, manufactures and markets Bridgestone, Firestone and associate brand tires. The company is focused on wholesale and original equipment markets, supplying passenger, light truck, commercial vehicle, off the road, motorcycle, agricultural and other tires to its customers in North America. Mississauga, Ontario-based Bridgestone Canada Inc. (BCA) is an affiliate of Bridgestone Americas Tire Operations, LLC (BATO). BATO and Nashville, Tenn.-based BATO are subsidiaries of Bridgestone Americas Holding, Inc., whose parent company, Bridgestone Corporation, is the world's largest tire and rubber company. BCA and BATO develop, manufacture and market Bridgestone, Firestone and associate brand tires. They are focused on wholesale and original equipment markets, supplying passenger, light truck, commercial vehicle, off the road, agricultural and other tires to their customers in Canada and the United States, respectively. The National Hockey League, founded in 1917, is the second-oldest of the four major professional team sports leagues in North America. Today, the NHL consists of 30 Member Clubs, each reflecting the League’s international makeup, with players from more than 20 countries represented on team rosters. According to a Simmons Market Research study, NHL fans are younger, more educated, more affluent, and access content through digital means more than any other major professional sport. The NHL entertains more than 250 million fans each season in-arena and through its partners in national television (VERSUS, NBC, TSN, CBC, RDS, RIS, ESPN America, ASN and NHL Network™) and radio (NHL Radio™, Sirius XM Satellite Radio and XM Canada). Through the NHL Foundation, the League’s charitable arm, the NHL raises money and awareness for Hockey Fights Cancer™and NHL Youth Development, and supports the charitable efforts of NHL players. For more information on the NHL, log on to NHL.com. Established in 1943, the Hockey Hall of Fame is a museum and place of entertainment offering state-of-the-art multimedia presentations and exhibits from its premises at Brookfield Place, Toronto, Canada. Its mandate is to recognize and honour the achievements of individuals, who bring special distinction to the game of hockey, and to collect and preserve objects, images and resource materials connected with the game as it is played in Canada and throughout the world. For more information on the HHOF, please visit www.hhof.com. NHL, the NHL Shield, the word mark NHL Winter Classic and the word mark Stanley Cup are registered trademarks and NHL FaceOff, NHL Awards, NHL Network and Hockey Fights Cancer are trademarks of the National Hockey League. All Rights Reserved. 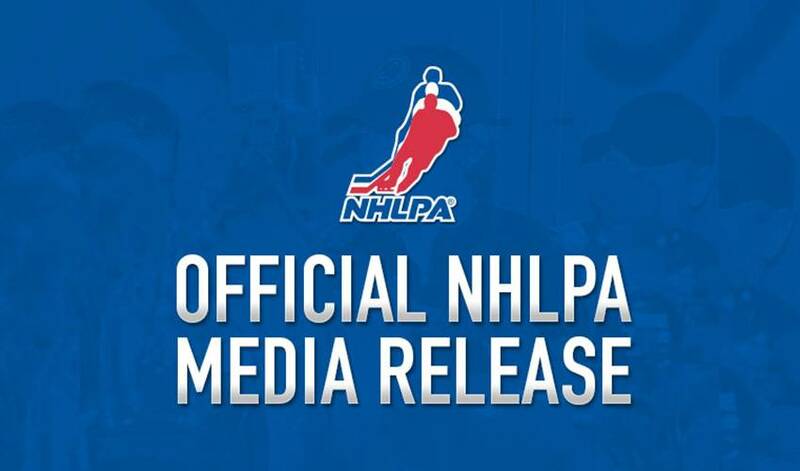 NHLPA, National Hockey League Players' Association and the NHLPA logo are trademarks of the NHLPA and are used under license.